Falafel is something that I have loved ever since I became vegan about 6 years ago. It is the ultimate fast food- portable, delicious and slightly healthier than the alternatives. In Madrid, and all over Europe, there is a falafel chain called Maoz. You can add-on to your falafel many salads- marinated carrots, olive paté, pickled beets, fried cauliflower, etc. You can add some hummus or guacamole and put it all inside a whole wheat pita and you are good to go! Except now, I can´t eat wheat and of course, I am doing raw. So deep fried morsels, no matter how tasty they may be, are out. I have experimented with several falafel recipes, some calling for sprouted garbanzos, others no. This is by far the best and most authentic raw falafel recipe I have come across. I love using sprouted garbanzos as well. In my experience, they don´t work so well for hummus- too sprouty tasting and grainy. For hummus, I think it is best to go with a zucchini base or a creamy nut base like macadamia or cashew. So here is falafel plate number 1- Falafel Lettuce Wraps: They have a romaine lettuce leaf for wrapping, marinated broccoli, avocado slices, a tomato/onion/basil relish, sprouted lentils and sunflower sprouts. With the falafels, of course. And on the side for dipping, a tahini-hemp cream sauce. Super yummy, and super easy to prepare! I made the tortilla wraps as per his recipe, and the roasted veggies were very similar except I used leeks instead of onions and added some finely chopped spinach as well. 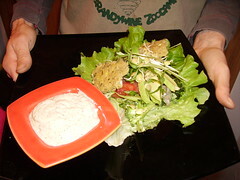 I used my falafel recipe, topped it with sprouts and then before serving I drizzled on the same tahini-hemp cream as above. I can´t find macadamia nuts here to make Russell´s hummus, although I imagine it would be amazing. This was well worth the time it took to prepare, and we have since made it a number of times. The roasted veggies alone are worth making! So, without further ado, here is the falafel recipe. 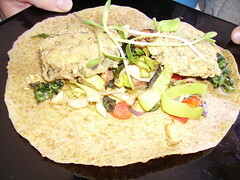 It is based on Jeremy Safron´s falafel recipe in his book The Raw Truth. In a food processor or high-speed blender, blend all ingredients except for parsley and onion until just slightly chunky. Then add parsley and onions and blend or pulse for a few seconds more. Form mixture into small balls and place on Teflexx sheet. Press down to make them slightly flat and dehydrate at 115 degrees for about 16 hours, turning once. We like them when they are still slightly soft inside and not completely hard throughout. If you like them a little more well-done, continue dehydrating to desired consistency. This recipe makes about 15 good-sized falafels and keeps well for up to a week in an airtight container. I imagine you could make a very large batch and store them in the freezer with good result if you wanted. I hope you try making raw falafel! This looks really good! I just got some Himalayan sea salt from Sustainable Sourcing https://secure.sustainablesourcing.com and I think I’ll try it out in this recipe. Thanks for sharing!